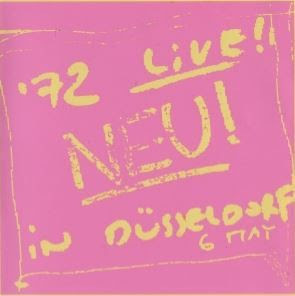 Kraftwerk's initial trio of still unavailable long-players aside, it was Neu! 's back catalogue that was most eagerly welcomed. Out-of-print since the late 1970s, due partially to a protracted loss of contact between founder duo Klaus Dinger & Michael Rother, the widespread availability of the Germanafon editions meant that many thousands of potential sales were forfeited before an official reissue programme could be launched. To make matters worse, Dinger - "in an act of despair" according to Rother - authorised the release of the below-par Neu! 4 (in actuality a rather mediocre session of October '85 vintage) & Neu! '72 Live In Düsseldorf via renown Japanese psychedelic label, Captain Trip. Rother, understandably upset at his consent not being sought, effectively delayed the official C.D. reissue of the original Neu! trilogy for a further half-decade - though when they did eventually appear, c/o Grönland / Astralwerks in 2001, I'm sure I'm not the only Neu! fan who bought the lot all over again. One condition of the licensing agreement was that both Neu! 4 & '72 Live be deleted forthwith &, though the former has since been remixed (arguably to it's detriment) by Rother following Dinger's death, the latter has remained tantilisingly out of reach.